Are you looking for a large grill with even more functionality than a standard premium grill? If you regularly cook large birds, BBQ cuts, or if you like to smoke and grill at the same time, then you would benefit from investing in a dual grill. A dual grill is not just a supersized version of a standard grill. The different models come with features that you wouldn’t find on a smaller grill, giving you unique cooking options. In many cases, you could find that a dual grill becomes your primary cooking appliance. The only problem can be finding the right one, which is why you’ll need this overview of the best dual grills on the market today. 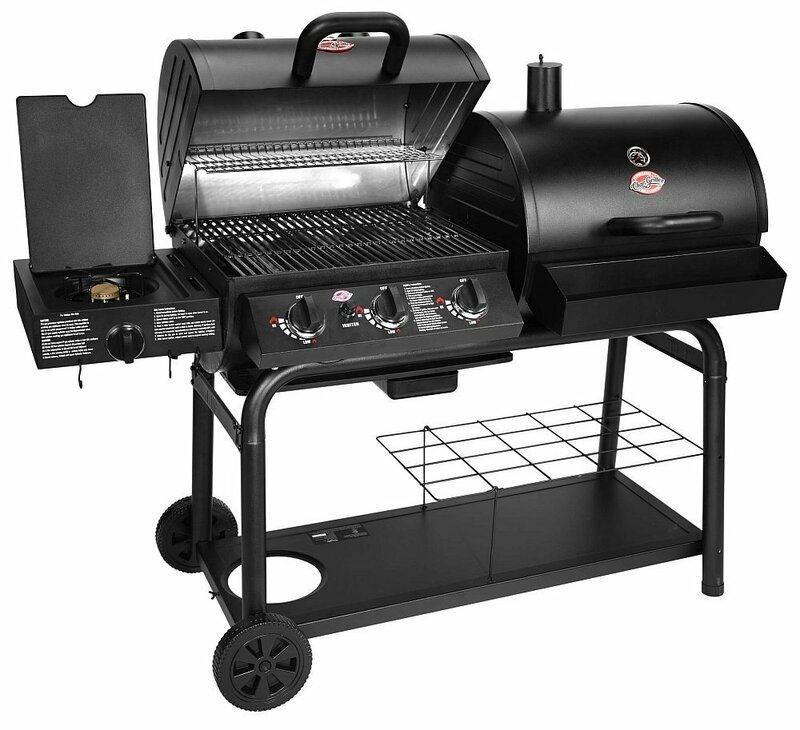 Although large and full featured, this is still a relatively affordable grill for the size. You can have the best of both worlds when you cook with gas and charcoal. Both fuels have advantages for outdoor cooking. Gas is convenient and reaches temperatures much faster than charcoal, whereas charcoal provides a more traditional experience with a light smoky flavor that is preferred by many grilling enthusiasts. On the Char-Griller 5050 Duo Gas-and-Charcoal Grill you get two completely isolated cooking surfaces. You could grill steaks on the gas grill while cooking a full chicken or large BBQ cut on the charcoal side. You could even add smoker chips to get authentic BBQ flavors from your favorite woods like mesquite, applewood, and hickory.One advantage that this grill has over similar dual grills is the gas side burner. This makes it a fully versatile cooking station where you can add a pot, frying pan, or skillet for almost any recipe that you can imagine. 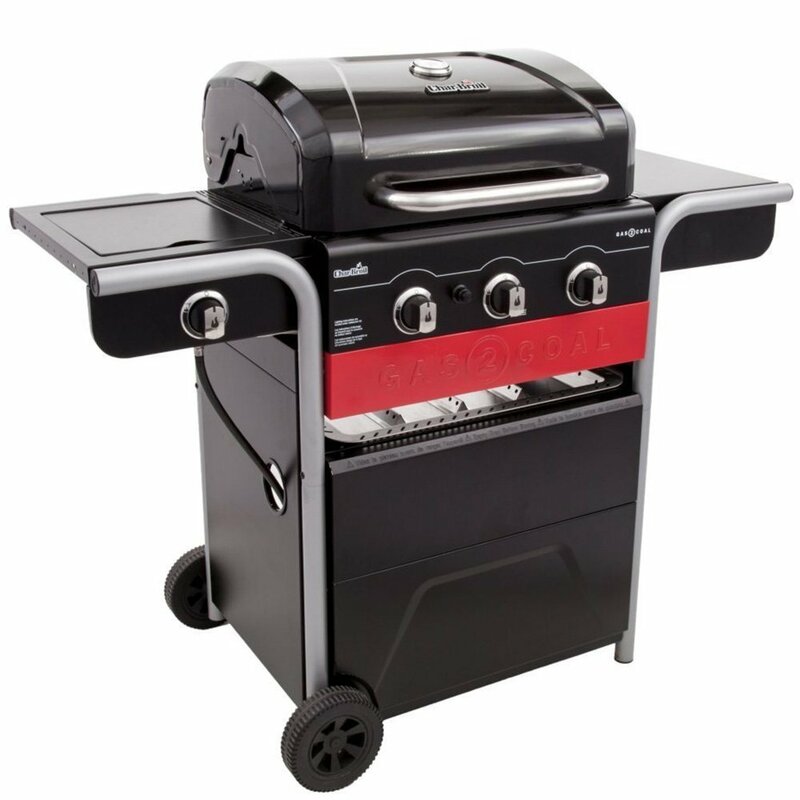 Although large and full featured, this is still a relatively affordable grill for the size. It’s made from high quality materials that will last for many grilling seasons.A four-star average review score from owners will give you confidence that this grill can get the job done, and it comes with a full warranty that you would expect from a brand like Char-Griller. 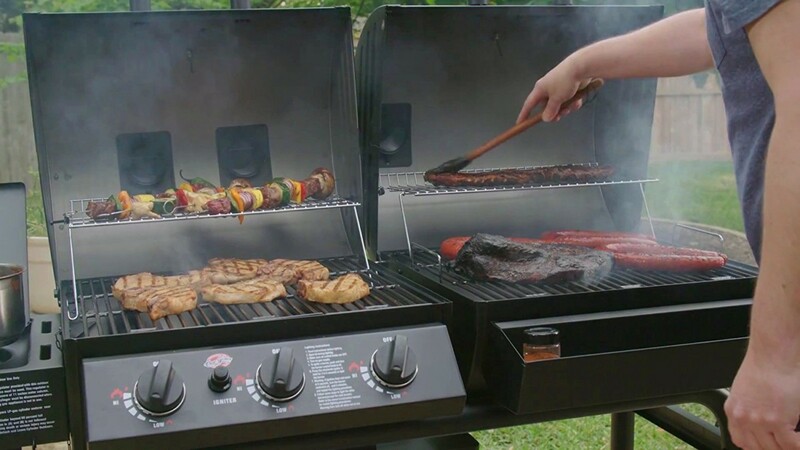 If you need to cook outdoors for large groups, if you want a smoker but don’t want an individual unit, or if you simply want the ability to cook with both gas and charcoal, then this is one grill that you will want to take a closer look at. Total surface area is a massive 1260 square inches, so you’ll never feel limited by what you can do with the 5050 Duo. This model offers 540 square inches of cooking area, which is made up of 420 square inches on the grill and 120 square inches on the warming rack. 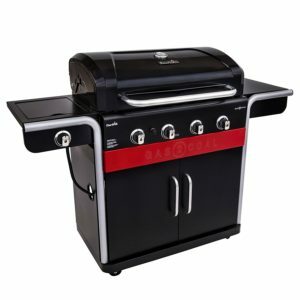 Although not quite as large as the Char-Griller 5050, this Char-Broil Gas2Coal Dual Grill is a great option if you want two fuel source options without the extreme size of a side by side grill. This model offers 540 square inches of cooking area, which is made up of 420 square inches on the grill and 120 square inches on the warming rack. It includes three gas burners, as well as a separately controlled gas side burner. 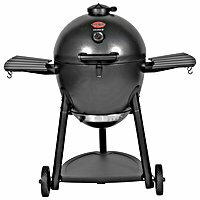 If you are using this to cook with gas, then you will find it to be just as capable as other gas grills of the same size. It can take care of family cooking needs, while offering enough space for holidays and special events when you need to cook for a larger group. The burners used on the grill are made from stainless steel and are of commercial quality. Stainless steel burners last longer than basic burners, so you’ll have confidence knowing that this will last for many cooking seasons. Of course, being a dual grill, you can also use charcoal as a fuel source when you want authentic BBQ flavor. 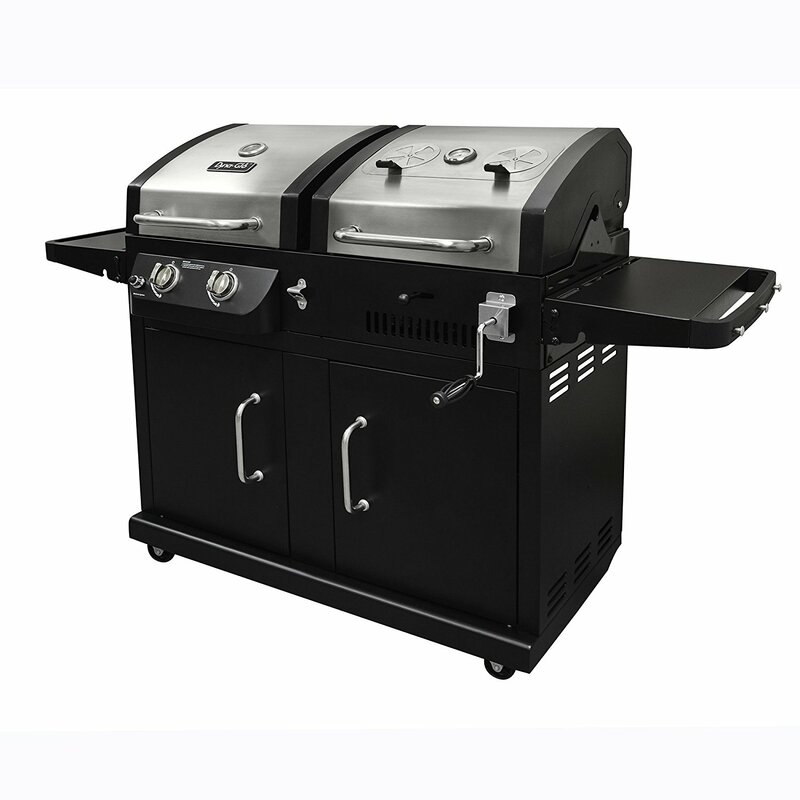 Unlike most dual grills, the charcoal firebox is below the main grill assembly. This is a unique design that saves space, and it could be perfect if you live in a smaller home. The design of this grill stands out, and it looks premium and would be suited to any modern home. The size means that it is more portable than most dual grills, so storage won’t be a problem. This grill is roughly half the price of a larger model like the Char-Griller 5050. This makes it perfect if you want to cook with both methods but want to remain within a tight budget. On this larger model, it’s easier to cook gas and charcoal side by side. 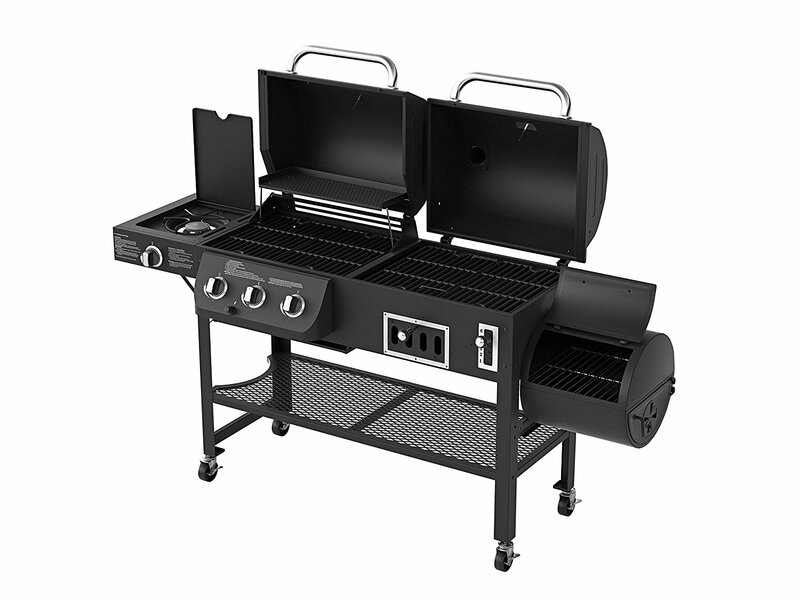 If you like the design of the previous grill, then this Char-Broil Gas2Coal Dual Grill will also interest you. It’s essentially the same grill with a larger cooking surface and an extra gas burner. If you need to cook for large groups, then this one is going to be more capable. 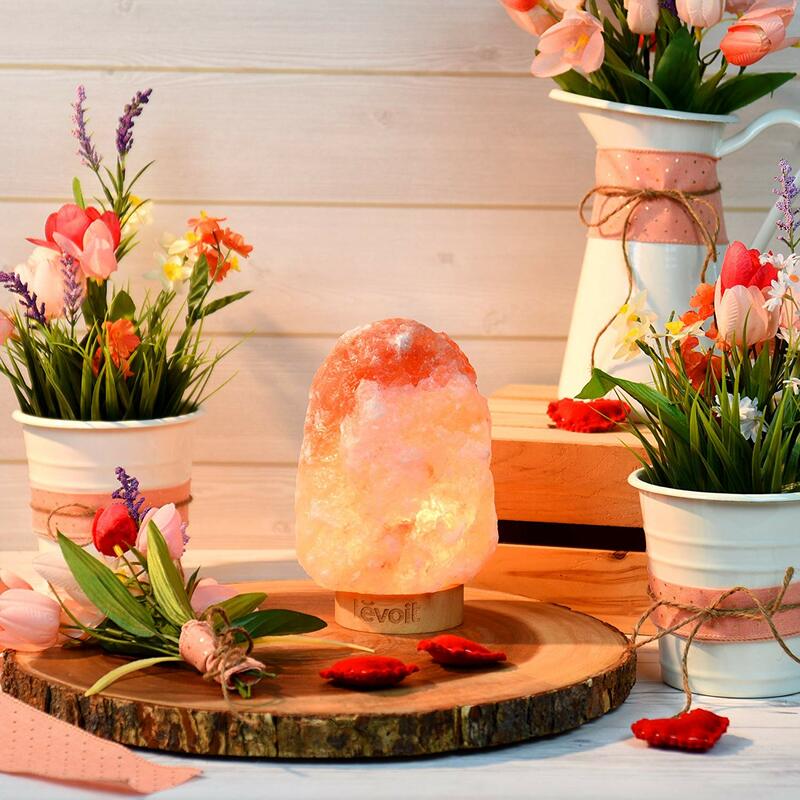 In most cases you will be able to cook all your ingredients at the same time, and the individual temperature controls will allow you to cook different ingredients without worrying about over or under cooking. The larger size makes this grill more versatile. It’s not just a matter of how much you can fit onto the grill, but rather how easy it is to have a separate charcoal and gas cooking zone. On the three-burner model it is more practical to use one fuel method at a time. On this larger model, it’s easier to cook gas and charcoal side by side. Like the smaller Char-Broil this grill only has a single hood, which makes it inherently less capable than the other grills that we have presented on this list. However, it does mean that the grill is smaller and more suited to a home where there isn’t a lot of space for an outdoor cooking station. Construction quality and looks are all top tier, and the added red accent on the front of the grill makes this stand out from your typical charcoal or gas grilling station. Buy this one if you need two fuel sources on a 530 square inch main cooking surface. A competitive price, great cooking ability, and an attractive black/stainless steel aesthetic make this grill a good option. Much like the first grill we looked at, the Dyna-Glo DGB730SNB-D Dual Grill is a side by side grill that offers an impressively large cooking area with both gas and charcoal cooking. The total surface area is 952 square inches, which results in enough area to cook up to 38 large sized hamburgers simultaneously. You’ll be able to mix your ingredients and cook for large groups with ease, and the separate cooking surfaces mean that you can cook different items without worrying about micromanaging your temperature zones. The gas side of this grill has two burners, which provide up to 24,000 BTU of heat. The charcoal side can be used with standard charcoal, or you could even use it as a smoker box for low and slow cooking sessions. If you regularly smoke meat and other ingredients and want to grill at the same time, then this is obviously one of the best options on the market. There are some features on this grill which make it more capable and easier to use than a standard charcoal grill. The charcoal side has an adjustment lever which allows you to effectively control the heat on the grilling surface. By moving the coals closer or further away from the food, you can go from a low smoking temperature, right up to a high temperature sear for steaks and hamburgers. The grill doesn’t feature a side burner, which will be disappointing for some. If you need that functionality then it would be better to look to other models on this list. It does have rotisserie mounting points, which will be appreciated for smoking and slow cooking. A competitive price, great cooking ability, and an attractive black/stainless steel aesthetic make this grill a good option if you need a large side by side dual grill for cooking at home. This is easily the best-looking grill on this list, and if that’s one of your primary concerns then this is the model for you. This is perfect if you want a dedicated smoker that is incorporated into a larger grill. The Smoke Hollow 6500 Combination Dual Grill departs from the basic design of the first three grills we have looked at here. 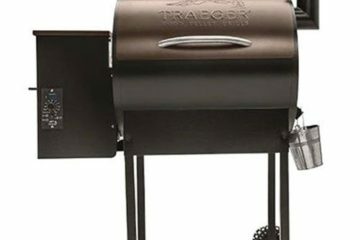 It can keep up with the best dual grills on the market, but it also has added functionality that would make it a better option for smoking enthusiasts. The gas grill side is fairly standard and what you would expect from a dual grill in this price point. There are three stainless steel burners, and a deep hood that allows for cooking larger BBQ cuts and birds with the lid closed. There is also a side burner, which is excellent for versatility and expanding your cooking options. There are no complaints with the gas side of things, and in that respect this grill can perform just as well as any other quality grill on the market. Things get more interesting when you move over to the charcoal side of the grill. Instead of having a firebox and charcoal tray in one, this grill incorporates a side smoker. This is perfect if you want a dedicated smoker that is incorporated into a larger grill. You will be able to cook food without it being directly exposed to heat, which will be something that charcoal and wood smoking purists will appreciate. The quality of this grill is exceptional. Design is basic in terms of the undertray, but the barrel and box design of the cooking area is quite attractive. The Smoke Hollow looks unique compared to most grills, so it’s a great choice if you want a cooking station that will stand out when you have family and friends around for a cookout. There are still the features you would expect, such as a three-burner design and a side shelf burner. 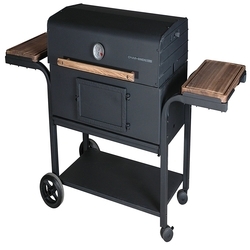 Based around a similar design to the Smoke Hollow Dual Grill is the Oklahoma Joe’s Charcoal/LP/Gas/Smoker Combo. This is a quality grill for people who have demanding cooking needs, and who want a primary smoker that also offers quick gas cooking abilities. The smoker box on this grill is large and designed for regular use. Whereas some dual grills make compromises to add smoking ability, this one feels more like it is a smoker with the gas cooking added as a bonus. It would be a great choice if grilling is secondary and smoking is your primary cooking passion. The design and quality of this grill is good; however, it is fairly basic in construction and that may be disappointing for some owners, especially considering the price. It is one of the most expensive grills on this list, so if you are on a budget then you could save some money by going for the Smoke Hollow, or even the Char-Griller or Dyna-Glo models. The ideal buyer would be someone who wants professional smoking capabilities without any compromises. When cooking with gas, there are still the features you would expect, such as a three-burner design and a side shelf burner, so you don’t have to worry about this grill not taking care of all your primary cooking needs. The only real concern will be the price, but for a large smoker box it will be worth it for many buyers. So, what’s our recommendation on the Oklahoma Joe’s Dual Grill? If you want a highly capable smoker that also does gas cooking, then this is the model for you. 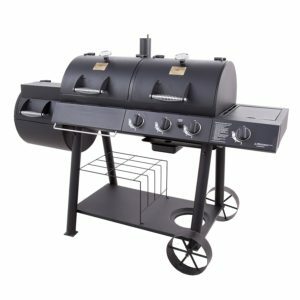 If smoking is secondary and you simply want a well-rounded and versatile grill, then you can get options of similar quality from the other dual grills on this list. We said that finding a dual grill can be hard, but that’s only true if you don’t have the right recommendations. 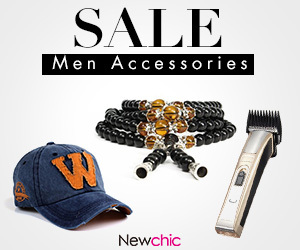 All the grills we have listed are excellent choices, and they range in price and capability. You’ll be able to find the perfect match for your needs and budget, whether you want a single hood dual grill like the Char-Broil models, or a professional grade smoker like the Oklahoma Joe’s.